Temporary water transfers allow water-rights holders to sell billions of gallons of state-owned water for millions of dollars, almost none of which goes to the state. State says still no definitive link between oil and gas industry and petroleum compounds discovered in water from some domestic wells. In 2012, the Powder River Basin Resource Council published a six-point plan to protect Wyoming’s groundwater. 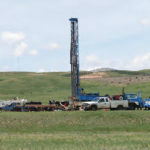 Wyoming passed a baseline groundwater testing rule for oil and natural gas activity, which may provide data needed to determine if drilling or fracking damages groundwater resources. Is Gov Mead’s exclusion charge against EPA hypocrisy? Pavillion residents left out of groundwater pollution negotiations could take issue with Gov. Mead's charge that Wyo. got excluded from regional haze talks.